This is a list of the many education-based work at home jobs (ESL tutoring, general tutoring, and teaching from home). VIPKid – Read Review – Bachelor's in any field or Associates degree in early childhood education required along with any formal or informal teaching experience. Most teachers earn between $16 and $24 hourly. Berlitz – $13 an hour for ESL tutoring. Must be native English or French speaker. Cambly – Read Review – Teach English to students from all over the world. Work anytime. Cambly pays .17 cents per minute for each full minute of talk time via Paypal. DaDaABC – Read DaDaABC Review – Teach English to Chinese children ages 5 to 16. Contract position with potential to earn up to $25 hourly. English Hunt – Read Review – Most video programs currently running require a Teaching Certification or SubstituteTeaching Certification and at minimum a four-year degree. A teacher certificate is not needed for our phone English programs. GoFLUENT – Read Review – ESL tutoring. Must have a degree. Hires in specific states. Golden Voice English – Read Review – Work as an independent contractor and enjoy flexible hours teaching English to others. Pay is monthly. Qkids – Read Qkids Review – Work online, teaching English to Chinese children ages 5-12. There is potential to earn over $16 hourly. Open to US and Canada. LearnLight – Read Review – Hires ESL telephone teachers. Freelance position, pays monthly. iTalki – Read Review – Teach any language from your home via a Skype or Voip connection. Pays once a month and open worldwide. Mango Languages – Needs independent contractors to teach languages online. Must commit to at least 20 hours per week with experience teaching language at the university level. Their needs vary regarding what languages they need teachers for. NiceTalk – Read NiceTalk Review – This is an app you can use to have conversations with non-English speakers. No special requirments needed to use the app and earn money, apart from just being a native English speaker. Open English – Read Review – ESL tutoring. Must have some experience in this and must be available at least 25 hours per week. Palfish – This is an app you can download to earn money having conversations with non-English speakers. All work is done directly from the app. No special requirements needed to use it and earn money, you just need to be a native English speaker. Panda Tree – US and Canada. Hires Spanish and Mandarin language tutors to work from home. Flexible, part-time schedule. Must be fluent in the language. You will be paid $12+ per hour. Rosetta Stone – Read Review – Pays $17 to $18 an hour for tutoring other languages. Sometimes you must live in a certain area to get hired however. TutorABC – Read Review – 4 year college degree required. Aim4A – Read Review – Often hiring eTutors. You have to use Skype to do the tutoring (Skype is available free). Brainfuse – Read Review – Must have at least a 4 yr college degree. Brainmass – Read Review – Get paid to be an online teaching assistant at Brainmass. Credo Tutoring Solutions – US only. Hires state certified teachers and online tutors. Evenings and weekends required. Edgenuity – Hires virtual instructors and tutors to work remotely from home. Full and part time positions available on occasion. Elevate Learning – Read Review – Pays $9 to $11 an hour. Must have some prior teaching or tutoring experience. Daytime hours. eNotes – Sign up as an educator and help students and teachers in the homework help area. Homework Tutoring – Get paid to tutor in the subjects of engineering, history, or law. Chegg – Read Chegg Review – General work from home tutoring. Very flexible. Must have at least some tutoring or teaching experience. You can sign up at as young as 18 years old. Pays weekly via Paypal or WePay. Instructional Connections – Regularly hiring online academic coaches in all disciplines. Limu – Get paid to teach or tutor any subject and receive a portion of the fees you charge. Magoosh – Get paid to answer student's questions via email regarding tests like the SAT, GRE, and GMAT. Math Elf – Get paid to help students with math questions. All work is done from your tablet. Must have some math teaching or tutoring experience to qualify. Prep Now – Read Review – US only. Bachelor's degree, two yrs experience teaching or tutoring, and good scores on the SAT & ACT required to get a job here. Flexible, part-time work. Revolution Prep – Hires online tutors and instructors. Some is onsite tutoring/teaching and some are online. Very hard to get in. Studypool – Read Review – An online marketplace for tutors with an expertise on specific subjects. Get money right after answering a question. TutaPoint – Read Tutapoint Review – Must have two years past tutoring experience to be considered. TutaPoint tutors earn $14 an hour plus bonuses & incentives. This is an independent contractor position. Tutor Vista – Hires both part-time and full-time tutors to teach students in all subjects. You must agree to work a minimum of four hours per day. Tutor.com – Read Review – US & Canada. Must be either enrolled in or graduated from an accredited university. WyzAnt – Has occasional openings for online tutors. Usually the positions are not 100 percent home-based and some travel might be required, so your location will matter with this company. See my list of online tutoring jobs for more ideas. Bridgeway Academy – Hires virtual instructors to help homeschooled kids online. California Virtual Academies – Must live in California. 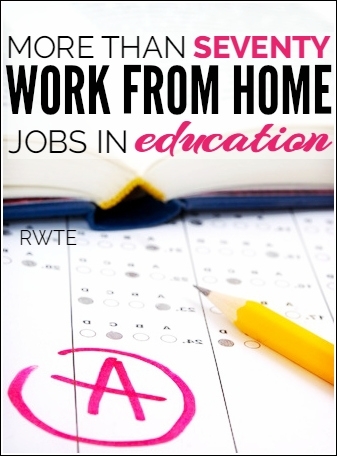 Hires certified teachers to work from home. Capella University – Hires college-level teachers to work from home. Look for the open “off-site” positions. Connections Academy – Read Review – Often looking for teachers to teach from home in a variety of different subjects. Edmentum – Hires virtual teachers throughout the US in a variety of subjects. Independent contractor position. Must have teaching certificate to teach grades 7-12. K 12 – Read Review – Regularly hiring teachers to work from home. Location-based. Kaplan – Occasionally hires virtual workers for online tutoring. You still may need to be in or near a specific city to get hired and some travel might still be required. Universal Class – Must have teaching certification and four year degree to teach online for Universal Class. You have to bid on projects you are interested in completing. The ACT – Work directly for the ACT reading and scoring student essays. Pays roughly $12 an hour. ETS – Read Review – $10 – $20 per hour. Rate depends on project. Non-residents of the US are occasionally hired for certain projects. Measurement Inc. – Read Review – US only. This is temporary, project-based work. You must have proof of a bachelor's degree in any field to qualify. Pearson – Read Review – $10/hour. US only. WriteScore – Read Review – This is work at home essay scoring. No experience required as they will train, but you do need to have a 2 yr degree. The work is seasonal and this is for US residents only. You cannot apply through the main home page. Instead, you must do a search on Career Builder (which is where they normally post their job listings) to see if they are actively recruiting. A Pass Education – Frequently has home-based openings for educational assessment writers. Must have a bachelor's degree and at least 2-5 hours of availability per day to respond to requests. ACT – They hire people to develop questions for workplace assessments. MetriTech – Has seasonal openings for K-4 passage writers for ESL assessments. Shmoop – Read Review – This company hires home-based writers with a degree and/or background in education to create their study guides and test prep materials. Study.com – Read Study.com Review – Formerly known as Education Portal. They hire contract freelance writers to create lessons for their students. In addition to writing positions, they also occasionally have video editing positions open. eNotes – You can sell your educational materials on this site as well as sign up as an educator to help others via their question/answer platform. Teachers Pay Teachers – Teachers, use Teachers Pay to Teachers to sell your lesson plans to other teachers. Udemy – Free platform for creating a course in something. Udemy keeps 15 to 30 percent of your earnings. Skillshare – This site is harder to get going with because they are only accepting applications to teach courses in a small number of fields. Maven – List yourself as an expert in just about anything and charge people for your knowledge. Consulting sessions are done via either telephone or email.